A simple LED lighting kit we put together that is very affordable and easy to install. AND it will make your friends say WOW! My kit includes lighting for both sides of your pontoon. These LEDs include the controller and remotes so you can have any color you want with the push of the button. My pictures are of my pontoon with most of the colors. You have 20 colors and patterns to choose from. You will get two 16-1/2' long LEDs, the remotes and controller, also the power hookup. Easy way to add some safety for. Safety for dockside loading and unloading at night. Great for attracting fish on your evening trips. Easily be seen out on the water. Easy way to help your sight when loading / unloading on lifts in the dark. What a simple way to turn heads at the dock. You will be the talk of the marina or the boat ramp. Easy to do and very bright. Looks great when your cruising down the lake or parked in the cove. Run your lights for hours with little impact on your battery. Adhesive type for ease of install. Can be cut to length - Every 3 LEDs you will find a cut point. Kit comes with 2 16-1/2' long lights for a total of 600 LED'S. Requires 12V power, just attach your lights, then run 12V power from a switch or battery with a ground and your done. Shown on my 24' pontoon boat with the same kit installed. Lime, Aqua, Medium Blue, Cool Blue. Blue, Indigo, Violet, Purple, Pink, White. They are rated for 100,000 hours of light use. We individually test every unit. These are totally waterproof and sealed. We initially power up every light kit to ensure that y ou do not get a bad product. MUST be paid for within 72 hours of sale ending. Our lights are usable in any type of water. We offer this in White, Blue, Red and NEON Green! Also our P R O T O T Y P E (ask) See our picture and other listings. We also carry the drain plug replacement underwater light kits for boats and jetskis. We also carry the drain plug LED for Seadoo and Yamaha jetboats. Check out my other items. All of our items and they are packed in the required packaging with reinforcement to ensure no one damages your item. We want to provide you with the absolute best service possible. Here is some of what are customers are saying about our lights. Check out all of our great reviews. The most awesome item ever! Excellant ebayer a real pleasure to do business. NICE PRODUCT AS DESCRIBED A+++++++++++++++. They will be getting more orders soon! 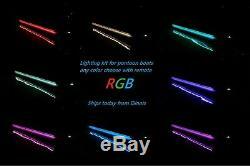 Super bright light at an even better price!!!!! Cool lights, can't wait to try them, thanks. Very fast shipper and great product as promised. Been looking for something like this at a reasonable price! A++++++ fast shipper awesome product. Great product, great communication, cares about customer A++++. CHECK MY OTHER AUCTIONS FOR MANY MORE MARINE ACCESORIES &SEADOO, YAMAHA, KAWASAKI, POLARIS PARTS AND TRAILERS.. If you feel that you have received any product or service that is less than 5 stars or described, notify us, and we will do our best to rectify the situation. The item "16'-24' PONTOON BOAT UNDER DECK LED LIGHTING RGB STRIP LIGHTS Marine Waterproof" is in sale since Tuesday, June 21, 2016. This item is in the category "Consumer Electronics\Gadgets & Other Electronics\Other Gadgets". The seller is "runninhotracing" and is located in Seneca, Illinois. This item can be shipped worldwide.